Rotherham have completed the signing of Sheffield United midfielder Ian Ross on a permanent deal, according to the Blades website. The 21-year-old went on loan to Rotherham in November 2007 in a deal which was to run until 1 January but it was extended for another 28 days. 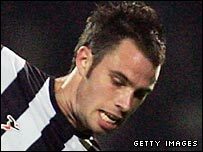 Ross spent the 2006/07 season on loan at Notts County. He has been unable to get a spot in the Blades senior side and has not played for the Bramall Lane outfit this term. Ross also had temporary spells with Boston United and Bury.